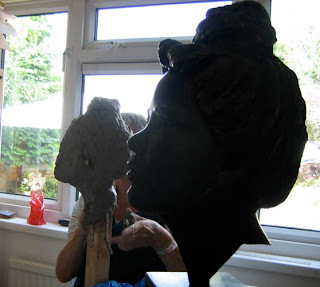 Student Dee's first day, sculpting a clay head. 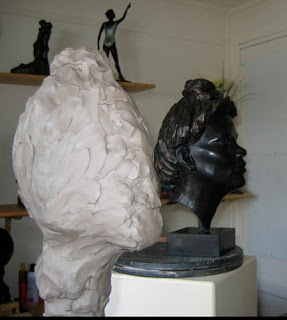 I will now show you a photo montage of my Student's first day sculpting "Jade's head" in clay. As I previously said, this student, we will call her Dee, had some experience of wood carving. These are two entirely opposing skills. With wood carving you remove the excess wood, with clay sculpture it is all about adding on the clay and modeling your sculpture. First we assembled the essential items needed to get started. (1 ) A Modeling Stand so Dee could work at eye level while sculpting her head of Jade. (2) The Original JADE on a similar revolving stand. We used a plinth with a "lazy betty' on top. (3) A 25 kilo bag of clay although we only used about half of it. (4) A Set of Calipers to measure with and a cloth dressmakers measuring tape. 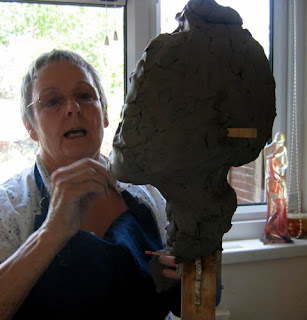 (6) A Bust Peg Armature for our clay head. You will see all of the above Items in the photographs. In the UK sculpture tools can be obtained from Tiranti's. (b) 2' x 2' x 18'H post screwed to the base with 4 small L plates. 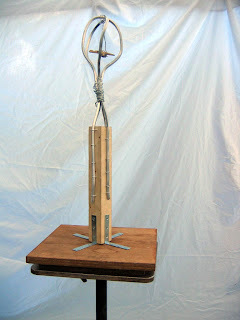 (c) 3 ft or 1 meter length of square aluminium armature wire twisted as shown and fastened to the bust peg with wire staples. (d) In the cavity for the head is suspended a "Butterfly" 2 small pieces of wood tied with wire. This holds the weight of the clay. Student Dee and photos taken after her First Session.